PHOTO COURTESY SHORTSTV A scene from "Bao," screening as part of the Animated Oscar-Nominated Shorts program. With the announcement of Oscar nominations comes my favorite awards season tradition: the theatrical release curated by ShortsTV of all the nominated short films. In three separate programs, the release gives audiences the opportunity to see all fifteen of this year's short films vying for Oscar gold in the Live-Action, Animated, and Documentary categories. Get a leg up in your office Oscar pool, and catch up with all the nominees before the Academy Awards ceremony takes place on Sunday, February 24. The most controversial entry of any short this year, Irish filmmaker Vincent Lambe's "Detainment" dramatizes the police questioning of two 10-year-old boys under suspicion of abducting and murdering a toddler. Inspired by the notorious James Bulger case that horrified the UK in 1993, the short is well-crafted and incredibly performed -- particularly by young Ely Solan as one of the accused boys -- but I found myself wishing Lambe was able to bring more insight to the shocking crime. Marianne Farley's lovely "Marguerite" finds an aging woman (Beatrice Picard) and her visiting nurse (Sandrine Bisson) forming an unexpected connection when the older woman revisits a long-held regret from her past. A touching portrait of compassion and empathy. Two young boys engage in a seemingly innocent game of power and one-upmanship that leads to tragic consequences in the haunting "Fauve," from Québécois director Jérémy Comte. Gorgeous cinematography and excellent performances from the two young actors make this one a stunner. In "Madre" a mother (Marta Nieto) receives a frantic phone call from her six-year-old son, who's away on vacation with his father and finds himself alone on an empty beach. Unfolding almost entirely in a single shot, Rodrigo Sorogoyen's tense drama brings vivid life to every parent's worst nightmare. The one outright dud in this year's lineup, "Skin" is a bewildering look at race in America, following the horrific events that unfold after a black man smiles at a young white boy in a grocery store checkout lane and ends up setting off a war between two gangs. Ham-fisted, implausible, and woefully misguided. 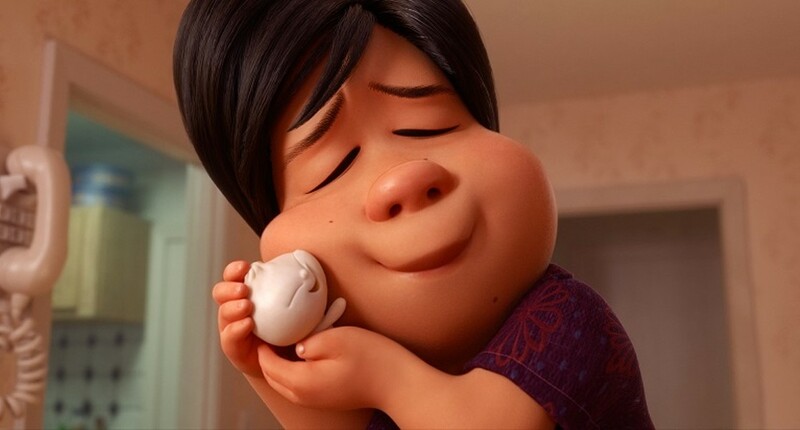 Domee Shi's beautiful "Bao" confounded audiences when it played in front of "Incredibles 2" this past summer, and I couldn't love it more. The modern fable is the story of a Chinese-Canadian woman who gets a new chance at motherhood when one of her handmade dumplings suddenly comes to life. Equally moving and mouth-watering. A group therapy session between various anthropomorphized critters descends into chaos in "Animal Behaviour" from Canadian filmmakers David Fine and Alison Snowden. Cute, but not much more, it's also the one animated short to buck the common theme of parent-child relationships. Memories of past and present condense and mingle in the mind of an elderly woman in the poignant "Late Afternoon," from Irish filmmaker Louise Bagnall. A young girl's dreams of becoming an astronaut are supported by her father and his modest shoe repair business in the gorgeous "One Small Step," which packs a wallop of emotion into its economical running time. "Weekends" is an impressionistic look at a young boy's experiences splitting his time between the homes of his recently divorced parents. With a painterly style, director Trevor Jimenez blends surreal imagery and vivid emotion to powerful effect. The heartbreaking "Black Sheep" lets Nigerian-British youth Cornelius Walker tell the story of how, as a boy, his parents moved him out of London and into a small village where he was surrounded by racists. Rather than fight back, he explains how he chose to assimilate and become more like his tormentors, as the film becomes a potent examination of identity and circumstance. It's hard to judge a film like "End Game," which tackles the undeniably raw, emotional issue of palliative end-of-life care, and the medical practitioners who seek to change their patients' relationship to death in their final days. Still, veteran filmmakers Rob Epstein and Jeffrey Friedman ("The Times of Harvey Milk," "The Celluloid Closet") bring a sensitive touch to the difficult material. "Lifeboat" chronicles the efforts of Sea-Watch, a German non-profit whose volunteers rescue refugees trying to cross the Mediterranean in search of a better life. In documenting the stories of both the refugees and those who seek to help them, this powerful film puts a human face to a global crisis, but I can't help feeling like there's more story here than can be handled in a single short. The seven-minute "A Night in the Garden" consists entirely of archival footage from a gathering of 20,000 American Nazi supporters at Madison Square Garden in February of 1939. With little editorializing, the film acts as a chilling cautionary tale of hatred then and now. The empowering and uplifting "Period. End of Sentence." follows what happens when a rural village outside Delhi, India installs a first-of-its-kind sanitary pad machine. The women of the village learn to manufacture and sell their own pads, finding economic and social independence, and kicking off a most surprising revolution.